There's something really wonderful about handwritten notes. I am endlessly in love with the mail. I'm a bit of a luddite, I suppose, but I'm pretty concerned that mail will become entirely paperless in my lifetime. I just completely love writing letters, notes, and postcards for people. The only thing I love more than sending mail is getting it. I've been sending lots of postcards via Postcrossing for one of my 101-in-1001 goals, so this week I received a card almost every single day! I have received cards from all over the world: Poland, Belarus, Wisconsin (USA), England, Belgium, Holland, and Germany. It's really neat to see the different cards, the stamps, the handwriting. A bit of a surprise with the mail this week: I also got a great letter from my best friend Jill back in Connecticut. 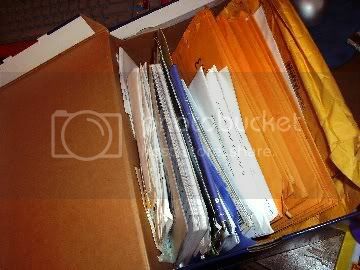 We're serious letter writers: one summer we wrote each other constantly even though we were only about an hour away from each other, and that shoebox of memories is one of my most prized possessions. She covered a lot of topics in this letter, one of which was my weight loss. You're a force and I'm so proud of how open and honest you are. I do hope you know that even if you never lost the weight I would have still continued to think you were beautiful and an amazing person. I don't look at you in photos and see an overweight unhappy girl. I see my best friend who makes me laugh ridiculously loud, takes beautiful photographs, speaks French! (one of the coolest things ever), is adventurous, hilarious, and completely lovely. I was thinking earlier of the sunset we saw in Paris ... behind Notre Dame and how incredible that moment was. Don't forget who you were before this because she was amazing - all 345 pounds of her!! But know that I will love you when you are 300 lbs, 200 lbs, 150 lbs, 130 lbs and whatever # you end up at you will be the most beautiful best friend I have ever had. I haven't seen her since I was my heaviest, and I've been missing her even more than usual lately. My dad called me yesterday and told me I should go to Connecticut for spring break. I'm not sure what to do. It would mean seeing Jill, and that would be incredible - fun adventures, great support, and a guaranteed ton of new lovely photos of me! But it would also mean time with my family - and all the good and bad things that fall under that umbrella. My dad said he'd pay for part of the ticket, so I could totally still take my all-about-me vacation this summer. I'm torn. What if I say no and something serious happens? I'd feel guilty about turning down the opportunity. *sigh* I'm a prisoner to guilt-inducing what-if's lately. I need to do some serious letting go - and letting loose! I've set a personal goal to figure out my spring break plans by the time I get to the office on Tuesday morning, so today will be full of big decision making. And now, the food. Per Caroline's suggestion, this week's recipe was Asian-inspired. I decided to try and make wonton soup - an old favorite that seemed not too difficult. And you know what? It wasn't! It was really easy and delicious. I used a bag of Asian vegetables, low sodium chicken broth (that I cut down further with equal parts water), and homemade wontons that were amazingly good. I made the wontons with store-bought wonton wrappers and filled them with a mixture of minced pork (I minced it in my food processor), chopped fresh mushrooms, green onion, and garlic, plus an egg and a teaspoon of soy sauce. You put a little mix in the wrapper, wet the edges, press to seal, and drop them into boiling broth until they float to the surface. Easy and delicious! 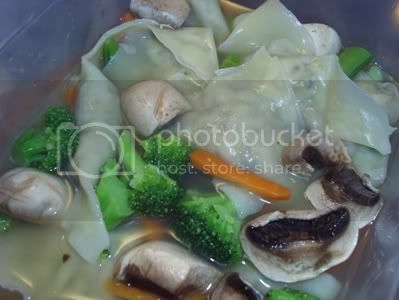 The only complaint I have was that the soup didn't keep very well - the wonton pasta was very thin, so while the soup was delicious the night I made it, it had pretty much completely fallen apart when I went to have it for lunch the next day. Also, the stuff-to-pasta ratio was a bit high, but that was mostly my fault for just trying to wing it instead of finding a real recipe. I froze most of the wrappers for another day (I could feel them triggering the overeating part of my brain and stopped before it could start - very proud of myself), and I turned the majority of the meat mixture into Asian pork burgers. I cooked them up on the George Foreman grill and then froze them for quick dinners. I had one Friday night, and it was delightful - I'd even consider making the meat mix again just as burgers! Je te comprends ce n'est pas facile de vivre éloignée de sa famille. Ma famille à moi n'est pas si loin que la tienne, mais c'est à 6 heures de voiture. C'est un peu comme cela que j'ai gardé mon esprit sain et que j'ai pu grandir en tant qu'individu. Des fois avec le confort de la famille on est moins poussé à faire des exploits, comme ta perte de poids. Moi je crois que si tu ne vas pas voir ton père tu vas ta tracasser avec cela encore. Si tu y vas, ce sera une belle visite, profites-en, tu pourras voir comment ton papa se sents. Tu reviendras avec un peu de nostalgie, mais aussi avec un sentiment bon dans ton coeur. Mais ça c'est moi, une étrangère, une personne extérieurs à ta vie qui te donne ces conseils, c'est à toi de voir ce qui ira le mieux avec ta vie. N.B. Est-ce que ça te dérange que je te laisse des commentaires en français sur ton blogue ? I'm sure you probably don't want to hear this... or maybe you do? Plus since your Dad is going to help with the cost, and given your job uncertainty, I would take him up on the offer, so you have some savings! The fact that he is asking you to probably means he needs to see you. Given his new diet and new lifestyle, I'm sure it would make him feel a lot better having the support of someone who is doing something similar. You could show him all kinds of recipes and help him out! Plus, you get to see your best friend... to me that sounds like an amazing vacation! OH YUM! That looks AH-MAZING! I love to get hand-written letters in the mail, too. :) No advice on the seeing family thing, as I think it is a very personal decision. Only you know what you can and cannot handle!